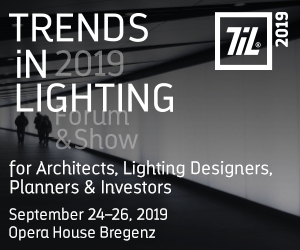 The lighting industry can immediate take advantage of this new development to empower product development, shorten cycle times and to create new opportunities in lighting fixtures for custom project applications. 3D printing technologies are already capable of printing many parts of a light fixture including metals, plastics, rubbers and electronics, with production of integrated luminaires on the rise! The process is commonly employed in the earliest stages of innovation and pre-development, enabling companies to gather insights from customers and use those to frame ideas for new products. A very helpful tool to create mock-ups of new concepts. Using this game changing technology, it’s now possible to have a functional prototype of your next generation lighting fixtures in hand in just a few days to engage the participants in the next product or customer meeting. The use of the 3D printing as an essential part of the product development process is rising. 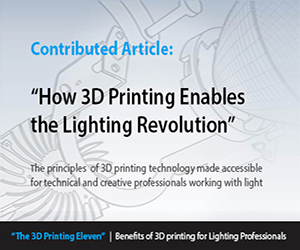 It might be still in it’s infancy, but the brilliant opportunities with 3D printing are getting discovered by the earliest lighting industry adopters. Today, first components are made by 3D printing, but a sure thing is that whole luminaries will follow soon. Integrated part production of complete luminaires will soon be possibe. 3D printing of decorative lighting products on the contrary, is ramping up fast. Empowered by the adoption by some leading architects and designers, the printing of lamp shades and shields for decorative lighting fixtures is booming. i.materialise, an online 3D printing service for people with an eye for design and a head full of ideas, simply turn the ideas of a designer – professional or not – into real 3D printed products. Here are some great examples of 3D printed lighting products: the “Fall of the Damned” chandelier as printed by MGX.Materialise, the Light Sculpture Lamp “Forms in Nature” from Hilden & Diaz Artists or the ‘ZooM’ from Michiel Cornelissen. They’re just some impressive examples of the endless possibilities that are now within the reach of every designer. While large OEM manufacturers see the need for volume manufacturing decreasing, individual lighting- and fixture designers are taking over the lead in developing custom luminaires and to meet the demand for a specific project application. Perhaps you have never designed a lamp before, but you are experienced in using 3D modeling software like Rhino, 3D Studio Max or Blender. The Materialise Instructables explains step-by-step how to design your personal table lamp or pendant fixture with a required minimum 3D design experience and get it printed instantly.